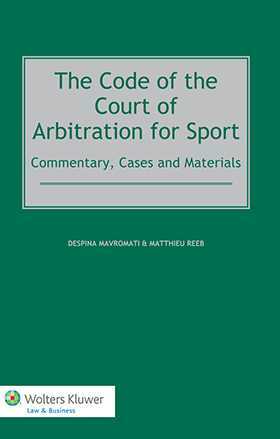 The Code of the Court of Arbitration for Sport: Commentary, Cases and Materials is a comprehensive exploration of the provisions of the Court of Arbitration for Sport (CAS). Providing detailed analysis of the CAS Rules, this is an indispensable work of reference for all sports law practitioners. Each provision is viewed within the larger context of international arbitration, in Switzerland, and procedural solutions are suggested which are transposable to international arbitration generally. How will this benefit your work? Reduce research time. Article- by- article analysis is supplemented by relevant doctrine, case law and documents and material from internal CAS practice, allowing you to quickly find the information you need, from one resource. Quickly gain understanding. All significant cases — about contractual issues, eligibility and disciplinary matters, governance issues and other types of disputes typically arising in the world of sport — are treated in depth as they arise under the relevant provisions. Fully understand the work of the CAS. Graphs and charts are used to explain practice and sample documents are included to show the exact procedure that is followed. practical matters, costs-related issues, including recourse to legal aid. Introduction – Word of the ICAS/CAS President. CHAPTER 1 Introduction: The International Council of Arbitration for Sport (ICAS) and the Court of Arbitration for Sport (CAS): 30 Years of History. CHAPTER 2 Statutes of the Bodies Working for the Settlement of Sports-Related Disputes. R27 Application of the Rules. R33 Independence and Qualifications of Arbitrators. R37 Provisional and Conservatory Measures. R39 Initiation of the Arbitration by CAS and Answer: CAS Jurisdiction. R40 Formation of the Panel. R44 Procedure before the Panel. R45 Law Applicable to the Merits. R49 Time Limit for Appeal. R52 Initiation of the Arbitration by the CAS. R53 Nomination of Arbitrator by the Respondent. R54 Appointment of the Sole Arbitrator or of the President and Confirmation of the Arbitrators by CAS. R55 Answer of the Respondent: CAS Jurisdiction. R56 Appeal and Answer Complete: Conciliation. R57 Scope of Panel’s Review: Hearing. R58 Law Applicable to the Merits. R64 Costs of the Arbitration Proceedings – General. R65 Appeals against Decisions Issued by International Federations in Disciplinary Matters. List of CAS Awards Referred to in the Commentary. CAS Awards from the CAS Ad Hoc Divisions.